Unipak Nile and its vertically-integrated sister companies deliver ‘smart-graphics’ water packaging for Nestlé Pure Life in Egypt. Packaging is a crucial element of the Nestlé Waters-Warner Bros. Consumer Products joint campaign to encourage children worldwide to be physically active, healthy and hydrated. 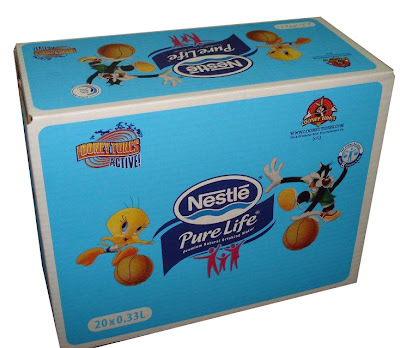 Egyptian manufacturer, Unipak Nile, cooperated with sister companies, Easternpak and Unipak, to print vivid, eye-catching Looney Tunes cartoon characters on corrugated wrap-around boxes for Nestlé Pure Life 0.33L water bottles. “The Nestlé Waters Looney Tunes wrap around carton was released in the Egyptian market and schools and had an excellent impact. The separation of colors, high pre-print quality, and final finishing of the box contributed to this success. Unipak Nile worked closely with Nestlé Waters and leveraged on the expertise of its sister companies to find the best combination of design, printing, finishing and capabilities to come up with the appropriate packaging solution. In June 2011, Warner Bros. Consumer Products (WBCP) renewed its partnership with Nestlé Waters to continue the joint campaign featuring Looney Tunes on Nestlé's water bottles. The extended partnership allowed new geographic expansions including the Middle East, Africa and Asia and added Nestlé Pure Life, Nestlé Véra and Nestlé Aquarel's brands to the project. Unipak Repro Center of Halat, Lebanon produced the digital flexographic printing plates for Easternpak pre-print operations. Easternpak manufactures pre-print paper rolls in up to 6 colors and converts corrugated packaging in Dammam, Saudi Arabia. Unipak Nile then converted the pre-print paper rolls into wrap around cartons. DuPont awarded Easternpak’s pre-print quality and Unipak Repro Center’s photopolymer plates for excellence in flexography in the ‘Corrugated Pre-Print E Flute & Finer’ category. Corrugated wrap arounds reduce paperboard costs, increase efficiency and enhance product display. Wrap around boxes are ideal for high-speed automated packing lines and are primarily used to pack beverage bottles, cans and multipacks. Unipak Nile, Easternpak and Unipak are members of INDEVCO Paper Containers, a division on the multinational INDEVCO Group.